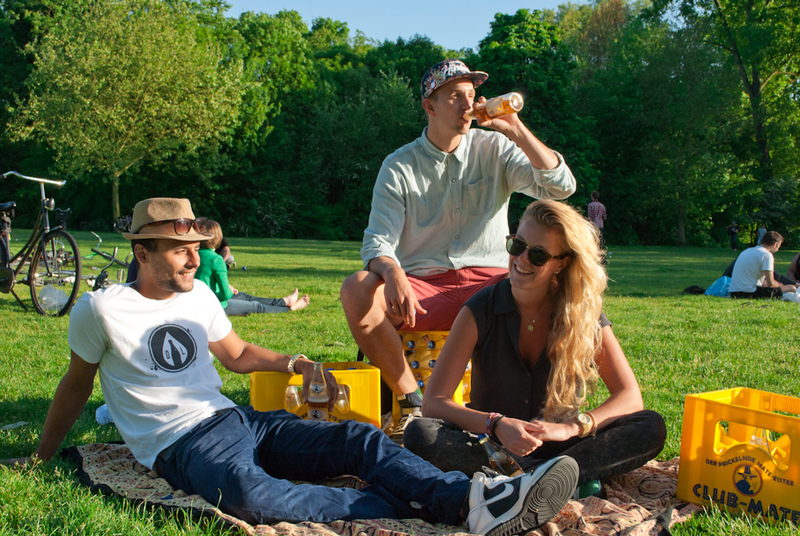 Dorstlust and Club-Mate are ready for the festival season. Are you? Forget Red Bull. Introducing: Club-Mate. For many of us the name might sound familiar, either because of Kurt Vile honouring it on his recent album or because it’s the primary energy drink in the Berlin club scene – and on its way to become just that in this year’s Dutch festival season as well! The South-American maté tea-inspired drink has been available in several Amsterdam establishments for a while now, but is becoming a known sight at parties as well. Who knew you could keep on dancing all night long on a mere iced tea? I know what some of you might be thinking: please stop it with all the Berlin crap – this drink doesn’t even taste good. I have to hand it to you, the first sip can be a bit disorienting: the taste of the South-American Yerba Mate crop is not something that we Westerners are used to. But you should power through and finish that bottle – you’ll get to appreciate the taste, you’ll see. Just think of the first time you had a beer. In old myths, Mate is said to be the beverage of friendship, so add that to the stimulating and revitalizing effects and the unique taste – what more would you want? Club-Mate is sold at several café’s and bars in Amsterdam already, with the Stadskantine being the latest addition. But for the more compulsive Mate-drinking ones among us (including yours truly), there’s the possibility of ordering Mate online and having it delivered straight to your doorstep. Dorstlust originated in the fall of 2012, when three friends, after having spent six weeks in Berlin, decided they wanted to continue drinking Club-Mate at home in Amsterdam. So why not import it themselves? In Berlin the variety in soft drinks is endless, nothing like we’re used to here. We’d like that to change. Although the idea of bringing Mate to the Netherlands resulted from self-interest, there’s something else to it: Dorstlust wants to contribute to the diversity of the Amsterdam (and eventually, Dutch) selection of soft drinks on offer. ‘We want people to be able to drink something else than the typical Lipton Ice Tea,’ co-founder Tessa Monfrooy explains. ‘There are so many unknown drinks worth trying!’ After selling solely Mate in their web shop for six months, this notion led to the addition of both Club-Mate Cola and Sauer, a German ‘rhabarberschorle’ which consists of rhubarb juice and sparkling water. Although both Club-Mate and Sauer are German drinks, Dorstlust is also looking over the German borders in their search of a-typical drinks to add to their shop. Good chance you’ll come across Dorstlust this summer. Clearly visible with stands at several festivals (Next Monday’s Hangover, anyone? ), but it’s likely you’ll drink one of their Mates at one of our favourite hangouts as well – among which Trouw, Amsterdam Roest, and De Vondeltuin. What would you call Club-Mate if you had to rename it? Answers may go to Sabrina. Also, if you have any suggestions for drinks Dorstlust should check out, let them know at info@dorstlust.nl.